When I visited Seattle I knew for sure I wanted to go to Woodland Park Zoo but I also wanted to see and learn a little more about the local fauna and decided Seattle Aquarium was the place to go for all things fish, mammal and bird related to Puget Sound. The Seattle Aquarium is located in downtown Seattle on the Puget Sound and opened its doors in 1977. The Aquarium houses a variety of species of fish invertebrates, sea and shore birds as well as marine mammals. At the time of my visit there was an exhibition of stunning artwork on display of colourful fish and their skeletons by Dr. Adam Summers which I found really interesting. I loved the play on colour and the ability to see inside the fish as if you had x-ray vision. Upon entering the Aquarium I was first confronted with a massive floor to ceiling tank – Window on Washington Waters. This 120,000 gallon tank has a 20′ by 40′ window and is home to over 800 fish and invertebrates that are indigenous to the Pacific North West’s local waters, including the Puget Sound. 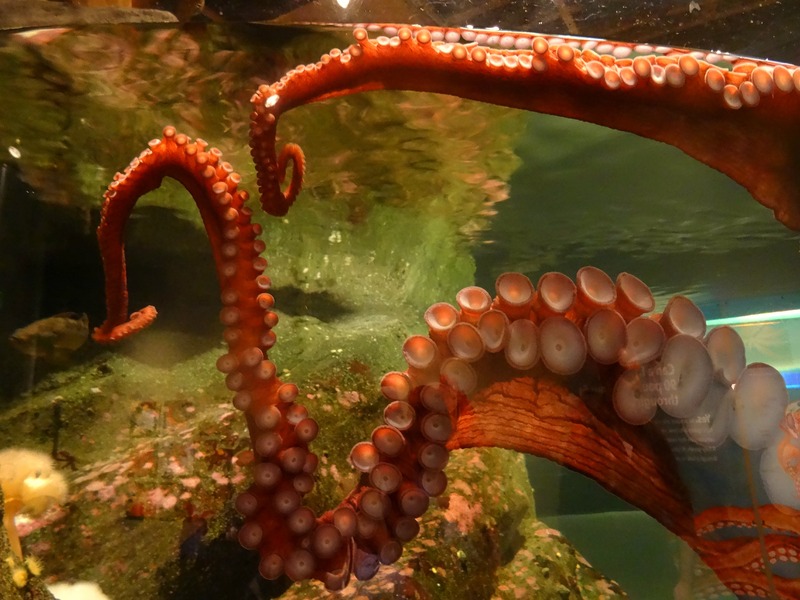 The biologists at the Seattle Aquarium actually conduct quite a bit of research on a variety of Puget Sound species including the giant Pacific octopus, northern sea otters, and sixgill sharks (yes there are sharks in the Sound). They also partner with local divers to conduct the annual octopus census. 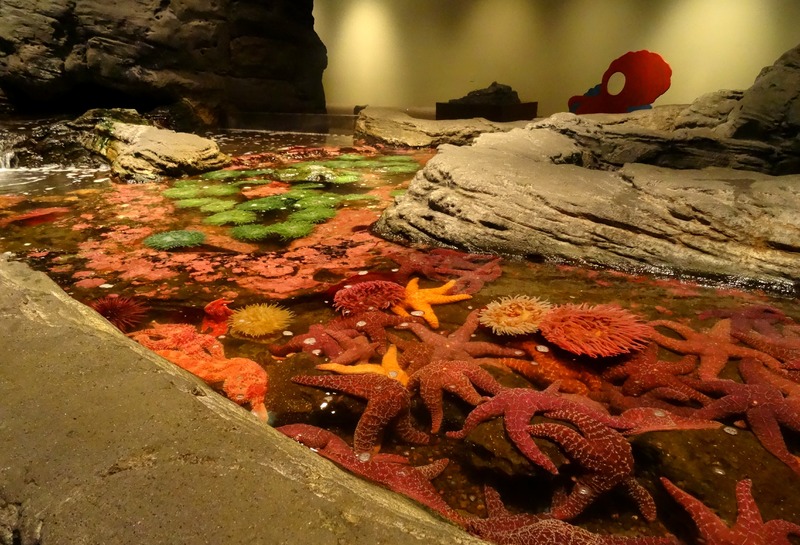 From the wall of Washington’s Waters to the Life on the Edge exhibit where you can interact with the life found below the waters in a variety of simulated tide pools that represent the tide pools found along Washington State’s coast and in Puget Sound. Here you’ll meet and get the chance to actually touch sea cucumbers, hermit crabs and sea stars. Fun for children and adults alike – its a great introduction to sea life for all. In the same room you’ll find mesmerizing moon jelly fish floating through the waters of a walk through tunnel and also meet Roland, the Aquarium’s 3 year old, 75 pound giant Pacific octopus. I’m always so amazed by these interesting and intelligent creatures and Roland really sucked me in. I must have stood at his exhibit for a good half hour chatting with a member of staff about him and was completely entertained with his activity level, swimming back and forth, spreading out his arms wide and then shooting across to the other side. The Seattle Aquarium has a great Pacific Coral Reef exhibit with a 25,000 gallon tank full of stunning fish from puffers, tangs, wrasses and so much more. Its here you’ll also encounter some rather strange looking fish in their Ocean Oddities tank like a yellow box-like fish called a cowfish with striking eyebrow protrusions who was so fast I had a hard time getting a good shot of him. The Aquarium is actually quite successful in the propagation of coral and doesn’t get any of its coral from the wild, which is a fantastic achievement with the sad state many coral reefs are in. On the their amazing exhibits is the Dome Room, its a 400,000 gallon tank that literally surrounds you with 360 degree views. Home to more life of Puget Sound; skates, sharks, rockfish, large sturgeon and much more. There was even a wolf eel out swimming around, which was a first for me, usually I see them mostly hidden away in between reefs or rocks, it looked so strange out swimming almost on its side it seemed. From scales to feather in the Seattle Aquarium’s Birds and Shores exhibit you’ll meet birds that are found on the shorelines of Puget Sound like killdeer, common murre and the rhinoceros auklet. The black oystercatcher also calls this exhibit home and was actually making some sort of call while I was there. These monogamous birds are actually quite striking with their long, thin, red beak that’s strong enough to break shells open. Also here is one of my favourites the puffin, the tufted puffin to be exact. These cute little shore birds can dive up to 100 feet and can hold up to 20 fish across its bill at one time. I was totally entertained by one of their little tufted puffins and watched as it dove into the water – of which there is underwater viewing – and spun around almost like it was dancing. I loved it! I was amazed at how fast they are underwater – like lightning. 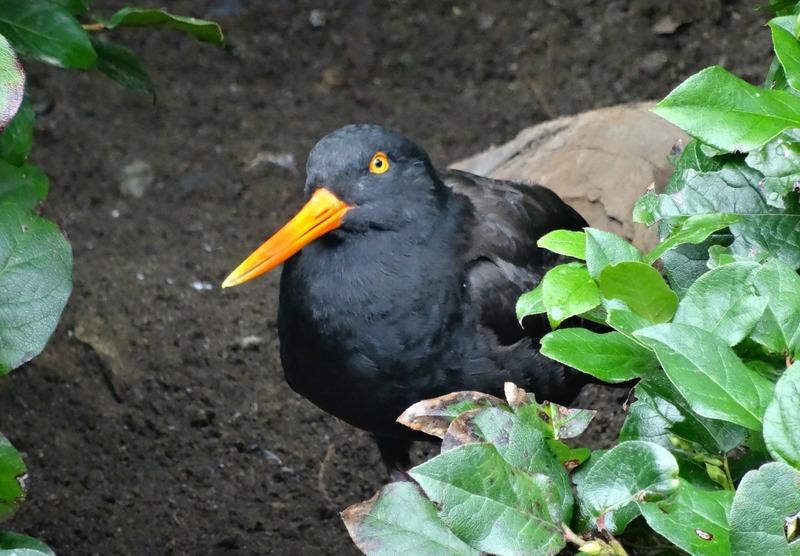 Most of the shore birds that call the Aquarium home actually survived injuries in the wild that caused them to be unable to be rereleased, but thankfully they’re safe and happy at the aquarium and act as ambassadors for their wild kin. The Seattle Aquarium is also home to some marine mammals such as the ever cute harbor seals, river otters and even fur seals of which only 11 are found in captivity in the US, two of them here. I was amazed by their sheer size, with males weighing up to 600 pounds and their sweet soulful eyes. Another great sight is the ever adorable northern sea otters. With males weighing an average of 65 pounds, these agile animals are excellent divers and can reach depths of up to 300 feet and remain under for up to 5 minutes. 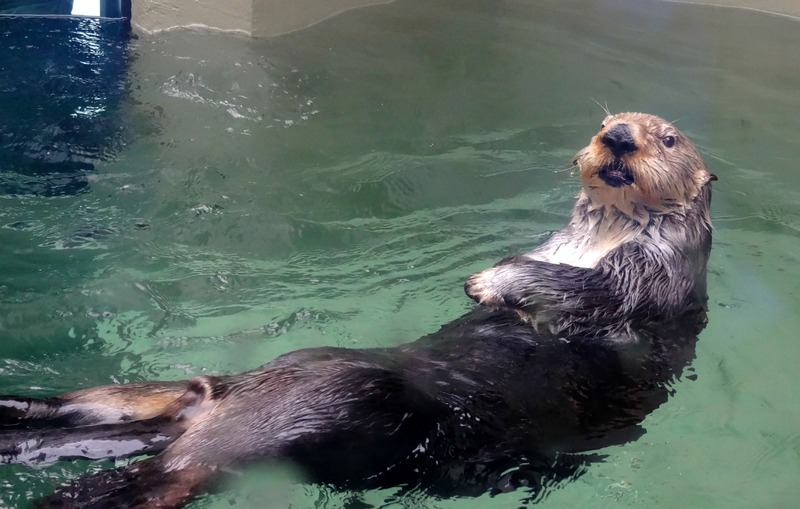 Sea otters have remarkably dense hair, the densest of any animal, with approximately 500,000 hairs in ever square inch of fur – hence the amount of time they spend grooming (15% of their day). I’m pretty sure I watched them for a good hour, from various viewpoints, as they dove down into the water (of which there is also underwater viewing), grabbed food and came back to the surface to float on their backs to eat their finds off their bellies. They were so active and one was extremely playful, jumping out of the water to dive in and twirling around, their so sweet to watch no matter if their playing, grooming or just floating around bellies up. The Seattle Aquarium is a great facility, for the various educational programs they offer for locals to the tremendous work they do to help promote life in the Puget Sound. Like their mission statement says ‘Inspiring conservation of our marine environment – begins right here at home”, they encourage and offer many tips and ideas for locals on how they can protect their local wilds. So whether you enjoy learning about and being entertained by marine life or you’re looking for a great indoor activity away from the Seattle rains, then Seattle Aquarium is a charming place to visit. To see more photos of my visit to the Seattle Aquarium visit Lady of the Zoos on Facebook!